Britain will have more than one women’s long jump finalist for the first time in World Championships history after Lorraine Ugen, Katarina Johnson-Thompson and Shara Proctor all advanced in Beijing on Thursday. 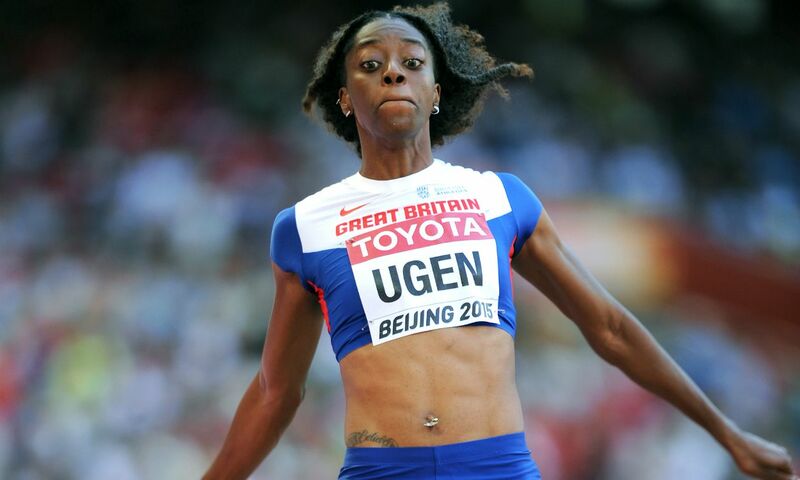 Ugen secured her spot in style, leaping 6.87m in the second round for her second best ever legal jump and the furthest mark by a female British athlete at the World Championships since Bev Kinch’s windy 6.93m and legal 6.90m at the inaugural edition in 1983. Ugen’s was the second best jump overall in the qualifying round, behind Ivana Spanovic’s 6.91m Serbian record. Johnson-Thompson bounced back after the disappointment of failing to record a mark in the heptathlon long jump which ended her medal hopes, recording a first leap of 6.54m when taking off 26cm before the board before the European indoor pentathlon champion improved to 6.79m in the second round to automatically qualify. Proctor’s best of 6.68m was also just enough to see her through. “Three Britons in the final, that is just amazing,” said 2013 outdoor US Collegiate champion Ugen, who competed at the 2013 World Championships in Moscow but didn’t qualify. USA’s Olympic champion Brittney Reese, who has won five consecutive world titles combining indoors and out, could only manage a best of 6.39m and does not make the final. Fresh from her 1500m victory two days earlier, Genzebe Dibaba clocked 15:20.82 to win the first 5000m heat ahead of Kenya’s Mercy Cherono, the silver medallist in 2013, and Mimi Belete of Bahrain, both with 15:20.94. The second heat was won by Dibaba’s fellow Ethiopian Almaz Ayana – the world no.1 following her 14:14.32 in Shanghai – with a time of 15:09.40 and she was followed over the line by compatriot Senbere Teferi in 15:14.57. With only one non-automatic qualifier quicker than her in the second heat, Britain’s Steph Twell qualified as a fastest loser from the first heat. Other athletes joining her in the final include Viola Kibiwot, Irene Cheptai and Susan Kuijken, though Kuijken’s Dutch team-mate Maureen Koster, who was eighth and in a qualifying position at 4000m, collapsed to the track and Twell later spoke of the intense heat. “It’s so hot out there, I can’t tell you,” she said. “Your legs feel good, but your throat is so dry. “There’s more to come and I think it was just a case of running my legs out, but I’m happy and where I want to be,” she added. Both Britain’s Chris O’Hare and Charlie Grice secured their spots in the 1500m semi-finals and they ran respective times of 3:38.43 and 3:43.21. Winners in the first round included Kenya’s Elijah Motonei Manangoi in 3:42.57 from Algeria’s Olympic champion Taoufik Makhloufi, defending champion Asbel Kiprop in 3:38.97 from Ethiopia’s world indoor silver medallist Aman Wote and Kenya’s 2011 world silver medallist Silas Kiplagat in 3:38.13 from Morocco’s Olympic bronze medallist Abdalaati Iguider. A number of good quality runners exited the competition from the first heat as Ryan Gregson, Jakub Holusa and Henrik Ingebrigtsen failed to advance just behind Grice, while world indoor champion Ayanleh Souleiman of Djibouti pulled up in the second heat. Defending champion Brianna Rollins went quickest in the 100m hurdles heats, clocking 12.67. British record-holder Tiffany Porter was the second quickest with her 12.73 to also ease through to the semi-finals where she will be joined by her sister, Cindy Ofili, who ran 12.97, as well as the likes of Dawn Harper-Nelson, Sharika Nelvis and Wu Shujiao, much to the delight of the home crowd. Britain’s Isobel Pooley and Morgan Lake didn’t enjoy the same success as their long jumping team-mates as neither could get over 1.92m and therefore finished outside the top 12 in high jump qualifying. Among those to clear that height and progress were Olympic champion Anna Chicherova, two-time world champion Blanka Vlasic and world No.2 Ruth Beitia. Poland’s world silver medallist Piotr Malachowski with 65.59m and Jamaica’s Fedrick Dacres with 65.77m were the sole two athletes to achieve the automatic qualification mark in the first round of the discus and will be joined in the final by athletes such as Gerd Kanter, Christoph Harting – the younger brother of three time world champ Robert – and Robert Urbanek.